Sharks Director of Rugby Gary Gold reckons there are no disciplinary issues in the camp, this despite the recent spate of red cards. Many will dispute this, but even if he is correct on this one, there are certainly a few cracks appearing in Durban that might need more than a little Polly-Filler to fix. Fourteen v Twelve against the Crusaders in Durban last Saturday, and yet still flyhalf Colin Slade was able to chip over the top of the Sharks backline, collect and score untouched. Earlier in the game (when it was still XV a side), there were two dropped passes in a ‘Saders shuffle to the wing, yet still the visitors were able to re-gather both passes and give the man on the outside enough space to run down the touchline and score. Throw in Kyle Cooper’s inability to hit a cow on the arse with a banjo, or get a pass to a backline player in his own 22 while under no pressure, the red card, and it what unfolded at Kings Park last Saturday was just an embarrassing disgrace. The Sharks have missed a monumental 160 tackles this year - the worst in the tournament, for a tackle success rate of just 83.9%, also the worst in the tournament. Sans a scathing attack (they are second last to the Cheetahs in defenders beaten this year), it’s not difficult to understand how Saturday’s debacle transpired. This from a side that convincingly won the SA conference last year and made the semi-finals. How? Change is as good as a holiday, or so says the cliché hand book. But what about too much change? CEO Brian van Zyl retired and in came young buck John Smit. Coach John Plumtree was deemed surplus to company requirements, so in came Jake White. That went South, so it was out with White and in with Gold. All while recruiting the services of Brendan Venter on an ad hoc basis, bringing in young schoolboy coach Brad McLeod-Henderson, and recruiting ex-Kings and Cheetahs defence coach Michael Horak. That is some pretty industrial change! Plumtree has gone on to work wonders with both the Irish and Hurricanes packs, while White has just signed for two years at Montpellier after successfully completing a season rescue act. They are quite clearly competent rugby men. It’s pretty easy to blame a coach and thus replace one man, but quite clearly, the problems run a little deeper than that. I am all for innovation in the game, and I like what I hear from Smit. But perhaps he is trying to turn the Sharks into Saracens, instead of taking learnings from that camp and implementing a few of them in Durban? He still attracts a lot of limelight as an ex player, even appearing in many Sharks ad campaigns. Is that what the union needs? Should the CEO really be taking leave to ride an eight-day bike race during Super Rugby? Clearly defence is an issue. What did Horak do at the Cheetahs and Kings to warrant his appointment? Is the legendary Venter rugby brain complementing the coaching structure or does he perhaps contradict what other coaches are saying? Are there perhaps too many chiefs? That said, given all the change at the top, and the lack of performance on the field, the spotlight simply has to fall on the players. Given the number of senior players and Boks in the side, has their focus perhaps moved to either the Rugby World Cup or lucrative overseas contracts after it, or both? Are there too many players in the squad that are getting no rest at all through playing in both South Africa and overseas? I am no fan of these “Special treatment” contracts that the likes of JP Pietersen and Frans Steyn have that allow them to not only play in both hemispheres, but also for the Boks when they play during the overseas season. Perhaps they are creating not only tired players, but big heads? How does this influence squad morale? Poorly, I would suggest. But perhaps most importantly, what is the union doing to develop young talent in the region? A cursory glance at last Saturday’s match-23 suggests that only five players, Pat Lambie - Michaelhouse, Marcell Coetzee - Port Natal, Fred Zeilinga - Glenwood, Waylon Murray - Westville, and Kyle Cooper - Westville, were schooled in the region. Rising stars Pieter-Steph du Toit and Cobus Reinach were schooled in Malmesbury and Bloemfontein respectively, and we all know the joke about where the Sharks stay when they play the Cheetahs - at home. Yes it is a professional game, and of course you can now buy a team, but money does not grow on trees, and there is still a lot to be said for a team and province culture that gets developed from the bottom up. College Rovers have done well in the Community Cup, and the UKZN Impi won the Varsity Shield on Monday night with young coach Ryan Strudwick at the helm. Perhaps less time and money spent on trying to keep big name players happy and in the region, and more on the talent convey belt in their own region? 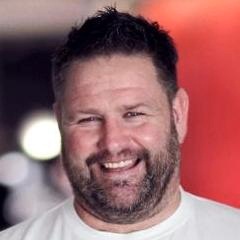 Tank is a former Western Province tighthead prop who now heads up Tankman Media, and sprouts forth on all things rugby on the Front Row Grunt.